I love learning more about my favorite city, Phoenix, Arizona. But I have no agenda. That is, I'm not trying to prove that one group of people is better than another group, or that something should have been, or shouldn't have been, done. Actually, I'm not trying to prove anything. I'm just looking at stuff. Now don't get me wrong, certain things about Phoenix upset me, and I will comment on, for example, how I would like to see more trees, more respect for Indian people because of their role in the history of Phoenix, and don't even get me started on the Gooding Building! But really, those are things that I've discovered along the way. I don't have an agenda. Not really. But I understand that most people do have an agenda. Sometimes it it's benign, sometimes it worries me. But mostly I just attempt to steer clear of that kind'a stuff, you know, with a smile and a nod, and wander off, which is what I do. I've been on the web for a long time, and I guess that there are other people like me. We find things, and it's just human nature to say, *hey, look at this! * which is how I use the social network Google+. Yes, I'm a *hey, look at this* kind of person. I mean, really, you gotta see this! And if you take a glance, and see what I'm seeing, that's enough for me. And there are other people just as crazy as me, who find stuff and tell me that I gotta see it. And I do! So there you go. If you have an agenda, that's fine with me. If you're setting out to prove something, or would like to change people's opinions, or anything, please do. You are welcome to use anything that I have found. I hope you do make Phoenix, and the world, a better place. Agendas aren't always bad. But it's not what I'm going. I'm just looking at stuff, and learning, and wandering off. I think I'm off to a good start. There is so much to learn, and so much to see! Thank you for adventuring with me. 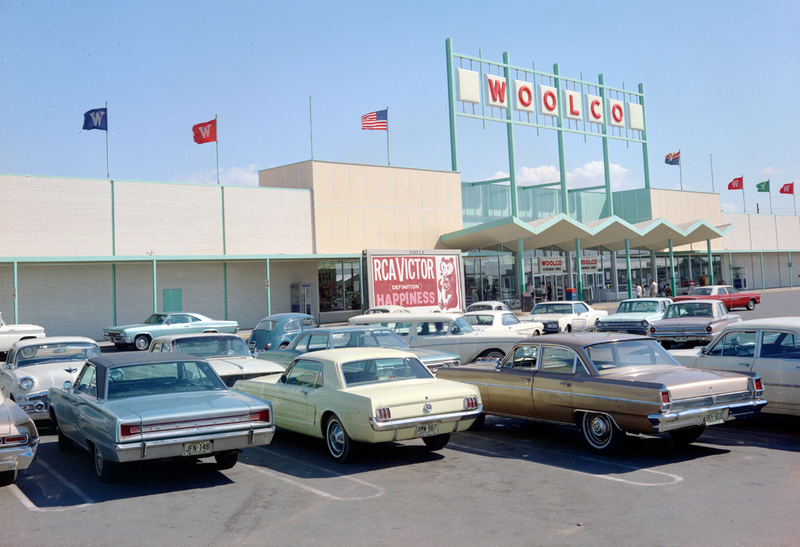 Image above: Woolco in the 1960s, 33rd Avenue and Indian School Road, Phoenix, Arizona. Maryvale. From the Duke University Library Digital Collection.